Welcome to Best Western Plus Newport Mesa Inn! We are a 100% non-smoking hotel offering a prime location, superior accommodations, friendly customer service, and affordable rates. Situated near many Southern California attractions, guests can enjoy a magical day at Disneyland, shopping at the world-renowned South Coast Plaza, or an event at the OC Fair & Event Center. If a relaxing day by the beach is more your speed, we are located only 3.5 miles from the ocean and fabulous Huntington and Newport beaches. We offer an assortment of room options to accommodate every travel party’s needs. Each guest room offers comfortable king or queen beds, warm and inviting room décor, a large flat screen television, a desk and office chair, a refrigerator, and a coffee/tea maker. Executive rooms are also available with choices including; sofa beds for extra sleeping space, microwaves, wet bars, and jacuzzi tubs. Each room highlights a spacious bathroom, with plush towels and complimentary toiletries, that make you feel right at home. We also have several ADA Accessible accommodations available for your total comfort. 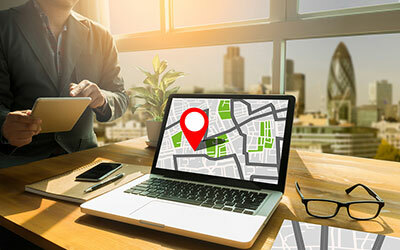 For your convenience, Best Western Plus offers free high-speed wireless internet in rooms and in public areas, free parking, a courtesy airport shuttle, a guest laundry, same day dry cleaning service, an on-site business center, a newly equipped fitness center, and a 24-hour front desk. Guests will also appreciate our complimentary Full American Breakfast offered each morning, available in our open and airy dining room. Upon return from a fun filled day or a corporate meeting, we invite you to jump in our heated outdoor pool or relax your tensions away in our hot tub. Whether you’re visiting for business or pleasure, you’ll enjoy an action-packed stay in the City of the Arts. Guests visiting Costa Mesa, California looking for convenient accommodations, with comfortable well-appointed rooms, and luxury amenities, need to look no further than Best Western Plus. Our friendly staff is ready to ensure a comfortable and memorable stay! We invite you to explore our various room options and find out why so many travelers make Best Western Plus their first choice when visiting Costa Mesa. 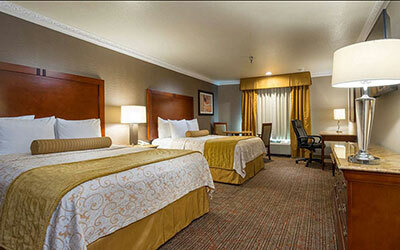 You’ll enjoy your stay in one of our comfortable rooms. Location, location, location! 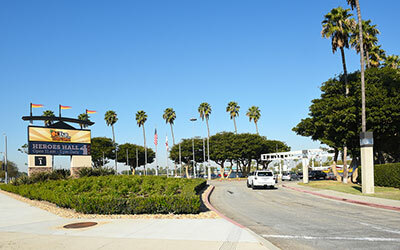 Our hotel is ideally situated directly across the street from the Orange County Fairgrounds and Event Center, and only 2 miles from South Coast Plaza shopping mall. Find your way to the Best Western Plus Newport Mesa Inn. Our interactive map and contact information can be found here. If you have questions, send us a message directly through our contact form.